Ci 2.0 College Camp - Huge Success! Where in the World is Charlie Bot? I enjoyed having a conversation with a camper's parent last weekend as we discussed the investment value of camp and compared it with the cost of higher education. This mom's evaluation was that the Ci investment was valuable to her because it would help guide her young person into the best higher education investment to maximize the gifts God has given to her child. Having taught college for 30 years, I saw many students add unnecessary tuition costs to their schooling expense because they did not know their interests, abilities and passions. 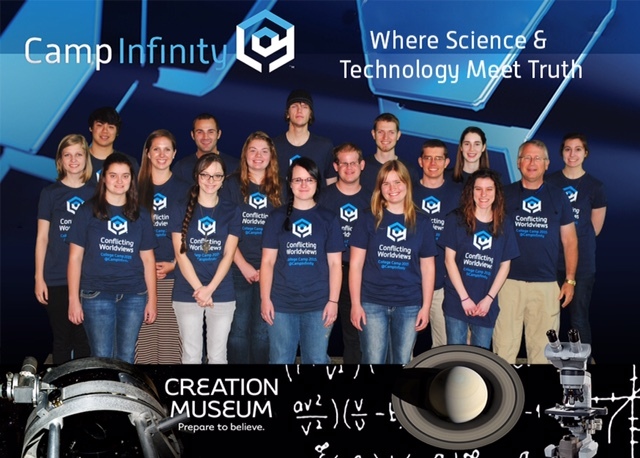 One of the goals of Camp Infinity is to help parents prepare their children to discover their abilities, interests and passions in STEM so they may make an educated choice about their future. We intentionally hire counselors who have made many of these decisions and are pursuing their interests and passions through God-given abilities. One of the ways we prepare our counselors for their ministry at Ci is to have them attend our Conflicting Worldviews College Camp. 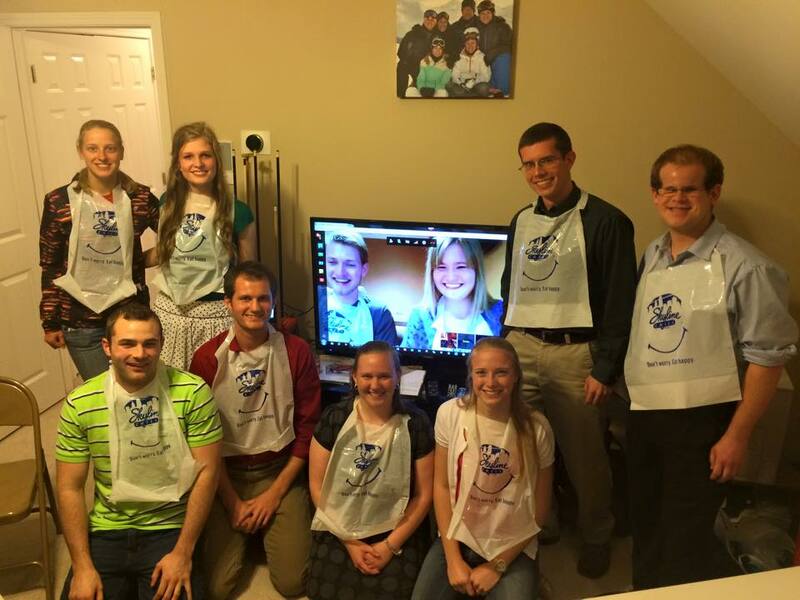 Last week, we brought together all of our first time counselors along with other college students from 8 colleges from around America to receive the best apologetics training from the experts at Answers in Genesis, the parent ministry of the Creation Museum. A very strategic time during the week was when Bodie Hodge, AiG speaker, took us through the Creation Museum and the Cincinnati Science Museum to equip us with a solid understanding of the conflicting worldview between biblical creation and biological evolution. In addition to this informative time, we covered 22 activities in 3 days. Among them were apologetics presentations such as Relevance of Genesis, Theology of Technology, Revealing the Unknown God, Dinosaurs, Dragons & the Bible. This training characterizes our acronym CAMP -- Creation Apologetics Made Personal. One of the college students who attended stated her view of the camp in this way: "For the longest time the word "apologetics" kind of intimidated me but not so much anymore. This past week I had the privilege to attend Conflicting Worldviews College Camp where I learned when you're defending your faith you have to start at the beginning. This camp helped show me what the Bible says about the beginning of times and how to defend it against other beliefs as well as many other things." We all recognize how rapidly technology is changing. For instance, look at all the updates on the i-Phone in the last several years! New technologies never force us or our children to do anything; however, they do give us choices we never had before. As parents, we all want to equip our children to have a biblical perspective on the role of technology in their lives. It is not enough to give them a list of "dos" and "don'ts." At Camp Infinity, we strive to partner with parents to teach their children biblical discernment as it relates to technology. As a STEM camp, we strive to come alongside our campers and demonstrate to them how to use discernment in the use of digital technologies on a daily basis. Our low camper to counselor ratio aids in this learning as our counselors teach the campers appropriate ways to use their own personal devices. Teaching our young people these principles will not only help them in their day-to-day living but will direct them to see how technology involves the repurposing of God's creation for man's benefit thus fulfilling God's command for us to be His image bearers and rule the earth. Because I have complete confidence in the steps that Ci has taken to insure each camper is cared for both emotionally and physically, I am excited for my older son to have his first chance to attend an overnight camp like Camp Infinity! 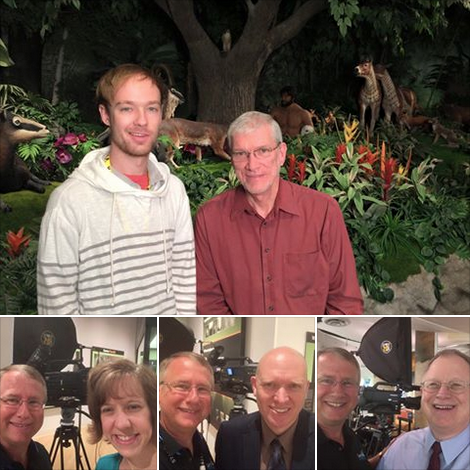 Using digital technologies, Camp Infinity and the Creation Museum met two weeks ago to capture audio and video bits. We had the privilege of interviewing several of the speakers and founders at Answers in Genesis. AiG staff shared their excitement about the connection with Ci. Among those interviewed was Ken Ham, Mark Looy, Dr. Georgia Purdom, Dr. Andrew Snelling, Dr. Tommy Mitchell, Dr. David Menton, Bryan Osborne and Steve Ham. We greatly value the special relationship Ci has with AiG and the Creation Museum. We started Ci with the express purpose of using the tremendous teaching resources of AiG to equip young people with a biblical worldview in the areas of science and technology. The staff of AiG play a critical role in helping us carry out our mission to inspire students to explore how science and technology integrate with a creation apologetics worldview, preparing them to explain and defend their faith and succeed in their STEM education and in their future careers. April 26 was our first full team meeting for Ci 2.0. It was exciting to use bits to connect our counselors from BJU, Clearwater and Cedarville. Otherwise known as digital technology, BITS are binary digits which make up the basic building block of everything digital - computers, email, Facebook posts, music, videos, photos, text messages, etc. We teach our campers to understand the basics of how these 1's and 0's work to transform the world around them. To see more STEM & apologetics posts, like us on Facebook. 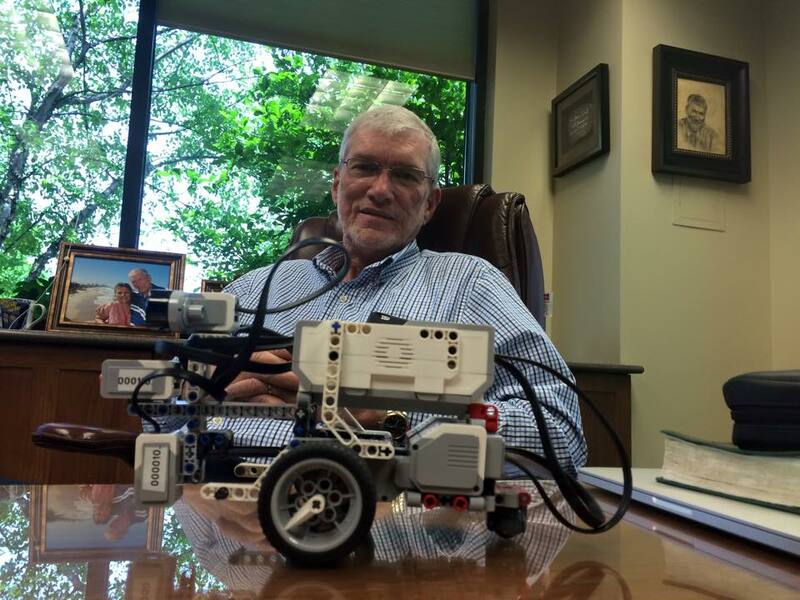 Charlie Bot meets Ken Ham, founder of Answers in Genesis and the Creation Museum. Ken has been a huge inspiration for and supporter of Ci. A note from Charlie: My Facebook page allows me to journal my travels so Ci campers, Ci parents, Ci counselors, Ci teachers, Ci scholarship donors, and Ci speakers can follow me on my STEM & apologetics adventures around the globe. So friend me and see all the exciting places I go as I promote the most exciting camp on this planet, Camp Infinity!! We have scholarships and financial aid available for the 7-Day and 5-Day camps. No obligation to apply. Please point folks to our website for details and to apply. If you would like some promotional brochures to hand out in your church, school or otherwise, send us your mailing address and how many you would like. We would be happy to drop them in the mail for you. Email [email protected] Thanks for praying and thanks for promoting!! We are excited about the 110+ who have registered so far. Our goal is for 160, 40 at each camp. If you would like to help us reach our scholarship goal of 85, please donate to our Scholarship Donation Fund which partners with families with academically gifted students who cannot afford the full cost of a STEM camp, you can donate securely using PayPal. Designate your donation to [email protected] which is registered with PayPal or use this secure donation link. If you would prefer to write a check, make it out to "Camp Infinity" and mail to 122 Montverde Drive, Greenville, SC 29609. Your entire donation will be used to help academically gifted and financially needy students attend Ci 2.0. Camp Infinity is a registered 501c3 with the IRS. Thank you for your interest and prayers for Ci. We are thankful that our first camp was a success and would appreciate your prayers as we prepare to engage hearts and minds with STEM and apologetics during the next three camps.